You’re listening to Frank Luther with a 1936 Decca record. De Brunhoff’s book had hit the market 5 years earlier, but his own children got a preview the summer before that. From their mother, in the form of a bedtime story. The tale was so popular with the children that they implored Jean to develop a story around it. In short, Babar moves to the big city after a hunter shoots his mother, gets some culture and heads back to rule the elephants after the death of their leader. This record, Babar the King, details the building of Celesteville, named for…Babar’s wife. Jean’s son Laurent would carry on Babar’s tales after his father’s untimely death at age 37. Watch an interview with him right here. 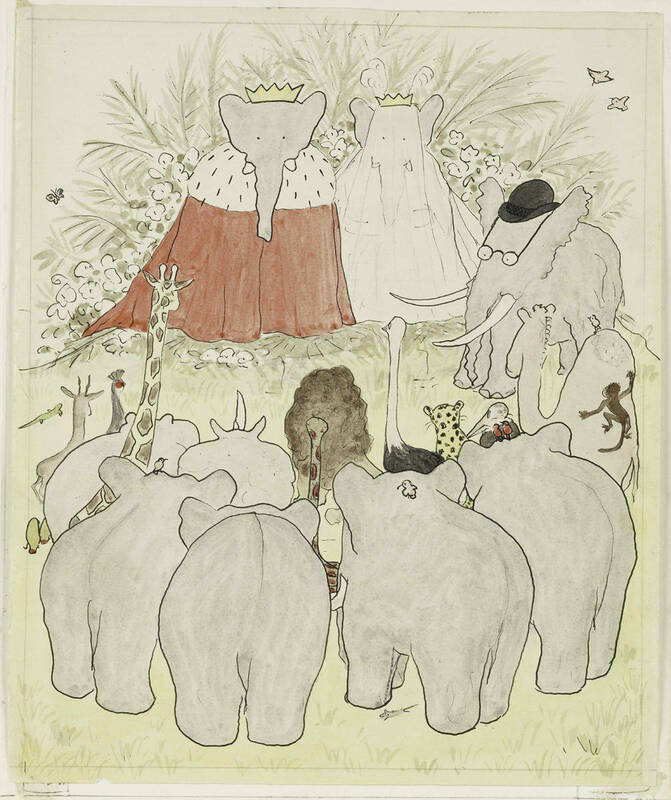 Image Credit: “Marriage and coronation of King Babar and Queen Celeste.” Histoire de Babar, le petit éléphant (The Story of Babar), 1931. Final watercolor. 14 1/8 x 10 3/8 in. (36 x 26.5 cm). The Morgan Library & Museum. The image is in the public domain.